WASHINGTON (CNN) -- Secretary of the Army Francis Harvey resigned Friday in the wake of recent reports of substandard conditions at Walter Reed Army Medical Center, a key facility treating troops wounded in Iraq. Defense Secretary Robert Gates announced Harvey's resignation at the Pentagon, just a day after Harvey removed the hospital's commander, Maj. Gen. George Weightman, from his post. Gates said Undersecretary of the Army Peter Geren will temporarily take Harvey's place. Harvey will leave on March 9. "I thanked Dr. Harvey for his distinguished service to the department and to the nation," Gates said. "This flagship institution must have its new leadership in place as quickly as possible." The Army later said Maj. Gen. Eric B. Schoomaker will take command of Walter Reed and the North Atlantic Regional Medical Command. Schoomaker now commands the U.S. Army Medical Research and Material Command at Fort Detrick, Maryland. Gates accepted no questions after his announcement, and didn't explain why Harvey resigned. However, he repeated something the Army said Thursday when Weightman was fired: The problems at the hospital reflect a lack of leadership. "I am disappointed that some in the Army have not adequately appreciated the seriousness of the situation pertinent to outpatient care at Walter Reed. Some have shown too much defensiveness, and have not shown enough focus on digging into and addressing the problems." Gates praised the doctors and other medical personnel at Walter Reed, and said they deserve support. Weightman, the fired commander, had said he was unaware of the substandard conditions. But in a memo signed by a deputy to Weightman in September 2006, five months before reports of the problems at Walter Reed came to light, concerns were raised about care at the facility after the Army's decision to privatize support services there. The memo obtained by the House Oversight and Government Reform Committee says Walter Reed "operations and patient care services are at risk of mission failure." Harvey had been the Army's top civilian official since November 2004. Before President Bush appointed him to the position, he spent much of his career working for defense contractors, according his Army biography. He says he will soon announce commission members and set a deadline for their recommendations. "Yet some of our troops at Walter Reed have experienced bureaucratic delays and living conditions that are less than they deserve. This is unacceptable to me, it is unacceptable to our country, and it's not going to continue." The president said steps are being taken to find out whether there are similar problems at other military and veterans hospitals. Bush said he is asking Congress for more than $86 billion for veterans' services for fiscal year 2008. If approved, "we will have increased the VA's health-care budget by 83 percent over the past six years, from about $20 billion to more than $36 billion." 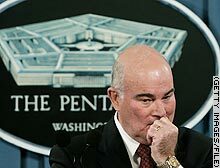 Secretary of the Army Francis Harvey holds a media briefing at the Pentagon in January 2006.